No, the name of the hotel has nothing to do with being mad or crazy. 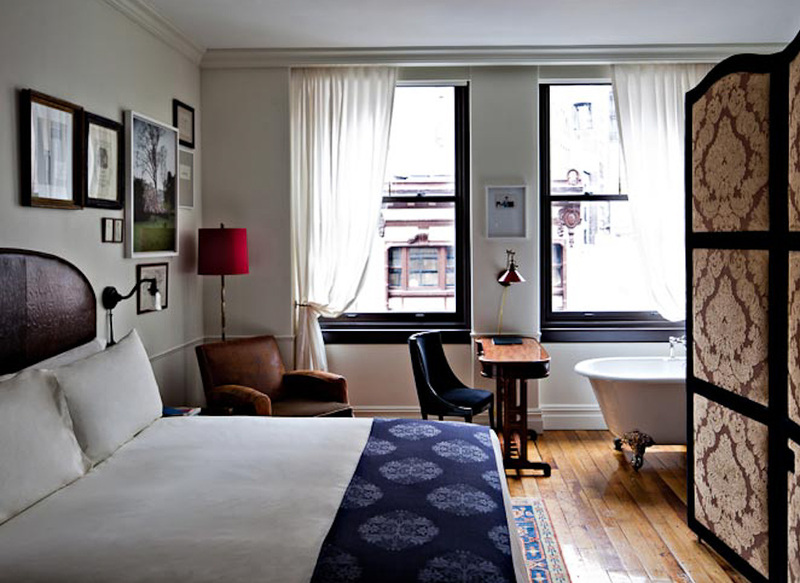 It is more about Mad Men, modern nomads and especially the location of the hotel: north of Madison Square. In this neighbourhood, which is overrun by tourist shops, the NoMad is an oasis of good taste. You feel like you’re in Paris around the turn of the century in this Beaux-Art building from 1903. At least, almost. Because the elegant rooms with silk covered folding screens, velveteen sofas, leather chairs, selected antique tapestries, all combined with lots of autumn colours creates the perfect twist into the contemporary. The library is well sorted and a wonderful place to draw back. For some top-notch dining you can go to the Breslin Bar and Grill and John Dory Oyster Bar.